For anyone that's played video games for an extended span of time, the name Square-Enix has long been synonymous with epic role-playing adventures and in-depth strategy battles. 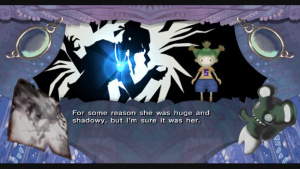 So when you see the company release a rather offbeat spooky-themed storybook adventure on WiiWare, your first reaction is likely one of bewilderment. 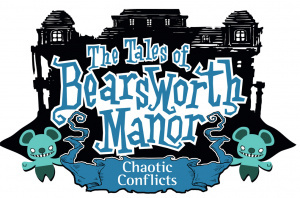 But with the release of Tales of Bearsworth Mansion: Chaotic Conflicts, the company has traded its swords and shields for tiny paper bears and frogs, and while not quite as deep as their usual brand of strategy title, there are still enough classic Square-Enix influences to keep things interesting. 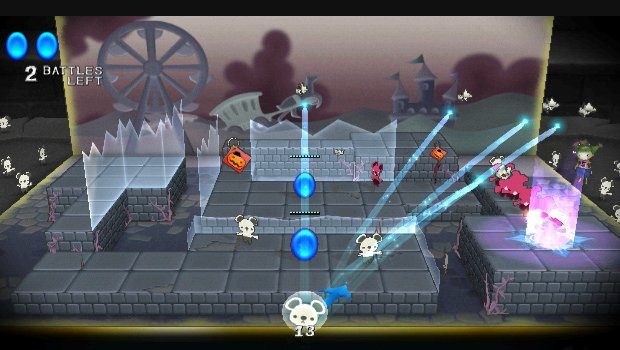 While the basic game itself feels a bit like a strategy or tower defense title, you'll quickly find that reflexes play a much bigger role in the game. You're given a squad of bear units that you must toss into battle on the playing field in order to protect your blue jewels from the angry mob of Badbears looking to destroy them. Each blue jewel comes equipped with a condition gauge that will tell you how many more times the jewel can be attacked before it's wiped out. Lose even one jewel and it's game over. Lose all of your bear units and you're also finished. Tossing your units into battle is as easy as flicking the Wii Remote. You aim your directional arrow by twisting the Wii Remote left and right. Once you see the arrow pointing in the direction you wish to toss a bear unit, you lock in by pressing the A or B button. Then all you have to do is flick the Wii Remote up and your character will toss a bear unit. The harder you flick the Wii Remote, the farther your bear will travel before hitting the ground running. This accuracy becomes more integral once you begin playing levels with ledges that you'll have to land your bear units on. It's quite tricky, but you'll begin executing it accurately with a little practice and timing. There are several ways to protect a jewel. The easiest way involves merely tossing your bear units into battle wherever you see Badbears popping up on the playing field. 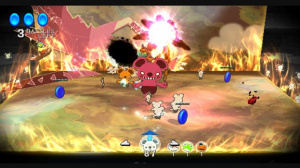 Of course, as the game progresses the Badbears become stronger, not to mention begin bringing special units along to help them, such as the Fire and Water-spitting Sprites that can quickly devastate your bear units if you're not prepared. Luckily the game gives you a little help as well in the form of special items and units. 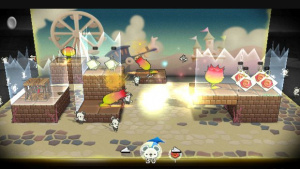 Special items range from elemental spells like Fire and Ice to special units like Jack 'o Lanterns that set fire to enemies and Penguins that freeze them. There's a very wide range of specialty items and units, but there is a catch: in order to make use of a special item or unit, you'll have to toss your bear units at them for collection. Then with a quick press of left or right on the D-Pad you can select them and toss them into play just as you would a bear unit. As you encounter some of the game's stronger enemies, you'll soon find out just how integral a part of the game these special items and stronger units are for your survival and that of your jewels. Once you've wiped out all of the Badbear threats in a level, the level is completed and the number of bear units you have remaining will be tallied up. Depending on how many bears you have left, you'll earn bonus medals. Getting better medals yields certain advantages and bonuses, so this facet of the game alone gives you plenty of incentive to go back and try to win better medals in each of the game's levels. And as you progress through the story, you can even unlock the game's Endless Story mode that will offer you up a, yes, endless number of levels to tackle – yet another incentive to keep improving your play throughout the game. Plus, if you can't get enough of what's included in the package, you can always spend a little extra dough for some downloadable content to sweeten things up a bit. The simple and responsive play control gives the game a very smooth and playable feel to it. Even switching between specialty items and units feels quite intuitive and easy to do, even in the heat of battle. The timing and feel of tossing the bear units is something that takes a little practice and getting used to, but that's part of the learning curve that proves to be so much fun as you learn the best ways to deploy your units and when and how to use the special items and units to really do some damage. There's a method to the madness and part of the fun is figuring it all out. When you first start the game, you're treated to a very nice level of visual polish in the opening scenes and menus, but for some strange reason, when you get into actual play the graphics tend to take a rather large dip in quality. Things begin to look a bit unrefined and jagged, and even the bear units and enemies tend to look rather bland and lacking in visual detail. It seems like a silly thing to gripe about considering the game does make use of a rather simple storybook setting, but the game's impressive opening cinema sets the bar right from the start and things tend to head downhill a bit from that point forward. One area the game is certainly not lacking in is in the audio department. Not only is the spooky-themed music absolutely amazing, the sound effects are also quite impressive as well. Even the surround sound used in the game is put to good use in setting the chaotic audio mood the game employs. There's honestly not a bad track or sound effect in the entire game and you can't help but appreciate what it adds to the other aspects of the game. Tales of Bearsworth Mansion: Chaotic Conflicts is obviously not a game that's going to appeal to everyone. Gamers who tend to prefer a more "grown-up" strategy experience will likely find the cutesy bears and penguins a bit much, but for those who can appreciate the silly theme and intense gameplay mechanics, the game certainly has its charms and can be downright addictive. Sure the game is a bit expensive at 1000 Wii Points, but considering how much content is included, it's certainly not an outrageous price to pay for some good silly bear-tossing fun. Looks interesting enough. 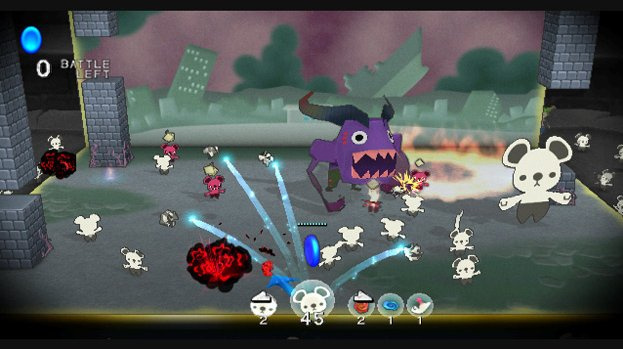 Since i own all the square/enix games on wiiware this is a no brainer for me. Love me some more square/enix! Corbes where did you find the time for this review? Oh well guess it back to work as usual. Great review btw. The game sounds quite fun, but for some reason I would have liked to have multiplayer included. It sounds like a game where that would have worked well; each player having a few jewels and can throw units towards enemies jewels, and so on. Any word on a PAL release? Sounds neat. So, is the other game the same thing? Can someone please make clear what Pay & Play DLC there is in both Bearsworth games, and what both games with all DLC cost. Thankyou. NintendoLife always forgets to list the true price and insight into the DLC, except when it's Mega Man. ^ Just check it and do the math yourself. All the DLC is listed in the manual (which you can read in the Shop Channel without buying the game). Thanks for the review Corbie. I imagine that you are probably doing the review for Puzzling Pages as well. I'm an adult and I still like cutesy bears and penguins so these games do appeal to me. The main thing that is putting me off about these games is the cost of all the DLC. Your review makes it sound like it is still pretty packed with content so I may consider giving it a try. I hope the other game turns out to be as good as this one. You don't NEED the DLC you know...? @Popyman: The game wasn't out in EU when I wrote that, so there was no chance of acquiring that information from the shop. Now it's out, so here is the missing info: The complete series is a whopping 6100 Wii Points. 1000 Wii Points for the game + 2000 Wii Points for the Pay&Play DLC = 3000 Wii Points total. 1000 Wii Points for the game + 2100 Wii Points for the Pay&Play DLC = 3100 Wii Points total. @Oregano: True, I don't need the DLC but if I buy this game I would like to play those extra chapters that Square Enix is selling as DLC. I just feel that this game should have been released as a retail disc. If I want to get the complete experience for both games I will have to spend as much as a PS3 or Xbox 360 game. Is it just me, or do micro-transactions cost more these days? I remember the days when games came with all of their content. But it's okay in this case because these games are so freakin' boring. The microtransactions definitely seem to be increasing in price. I imagine the companies realize that the people who want DLC will pay a lot for it, and the people on the fence usually decide against it. @17 I disagree. I think they're increasing in price because gaming companies realized "Man, we're kind of getting screwed over on this whole DLC-fad." I still don't think they're asking for anything outrageous, especially for a game with DLC like this game has. You pay ten dollars for the game. That's already one sixth of the price of a game you'd buy, new, at a store. Then you pay another twenty dollars optionally to extend the length of the game and usually give you new play options, meaning overall you still payed less than half what a new game costs at the store and with a game like this you're nearly getting the same value out of it. So for sixty dollars I can get both of these games, with all DLC, without even leaving my home, and don't have to worry about a disk getting ruined, or stolen, or damaged. I guess it's just generational differences. I vastly prefer the hard copy of the disc to the download games I can get, for a variety of reasons (the least of these being that I can sell back a hard copy of the game, as I actually have the rights to the object, and not merely its content). One last thing: yes, the game is 1/6th of what I would pay at the store, but no one is going to confuse any downloaded game with, say, "Uncharted 2," "Mass Effect 2," or "Mario Galaxy 2". But, different strokes for different folks. I don't believe that game companies are getting "screwed over" on DLC, but I'm not a fan of DLC in general, so naturally I'd see the worst here. @19 Psh well obviously no one's going to prefer this game over blockbuster titles like Uncharted 2 and Mass Effect 2, that'd be just downright silly. But it must be said that there really are some full retail release games out there that are worse than these games. And I actually prefer having a disc too. I'm vain in the fact that I love to have a collection to look at. Nothing beats looking at a bookcase of games and stroking my beard as I contemplate, "Which one now?" I was just trying to be the objectionable third party.